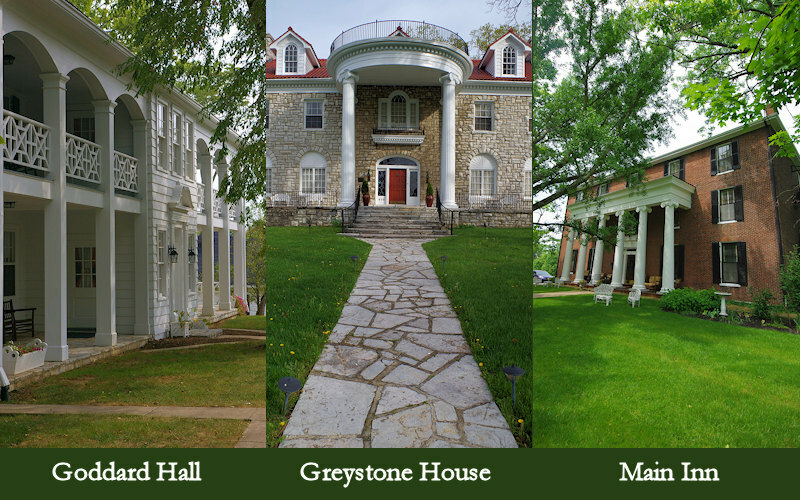 The spacious, park-like grounds of the Beaumont Inn include three buildings (Goddard Hall, Greystone House and the Main Inn) in which the 31 guestrooms are located. Each building is an integral part of the history of the Inn, and each expresses a distinct period of the heritage of the family. 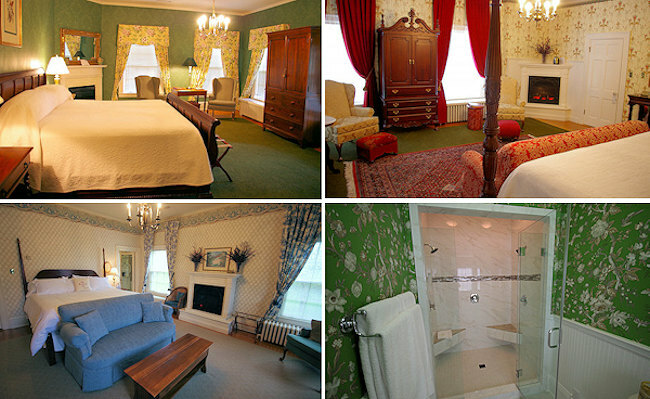 Guestrooms are tastefully appointed, many with antiques from the original furnishings. All rooms have free wi-fi, private baths, cable TV, telephone, hair dryer, air conditioning, iron/ironing board, and comfortable seating. The guestrooms emphasize guest comfort and provide amenities which contribute to a pleasant atmosphere. See the many inn amenities to enjoy. Also see our Packages. Goddard Hall, built in 1935, features 10 deluxe guest rooms with queen beds, private baths, central air conditioning/heat with individual room controls, cable television, telephones, coffee makers, and Wi-fi access. It’s a perfect place for a family reunion or groups since it has great porches for gathering. Goddard Hall is named after Annie Bell Goddard, founder of Beaumont Inn. Several of these rooms contain framed memorabilia and articles of clothing belonging to the founder. Two of the rooms have a Murphy bed to sleep an extra person. All of these rooms are “Silver” level (see rates below). Call for reservations, 8 a.m. to 10 p.m. EST: 1-800-352-3992 or 859-734-3381. Check availability now & book online. The stately Greystone House was built in 1931 as a private home. Today it offers four spacious Platinum Suites, all with private baths, cable television, wi-fi, coffee makers and individual-room climate control (including air conditioning). The large side porch is a great spot to relax. A full breakfast in the dining room of the Main Inn (next door) is included. Our romantic Platinum Suites include features like a king-size bed, two-person whirlpool bath, two-person rainforest shower, private-screened-in porch and dimplex electric fireplace. Since features vary room to room, call us to book the perfect one for you! Call for reservations, 8 a.m. to 10 p.m. EST: 1-800-352-3992 or 859-734-3381. Check availability now & book online. 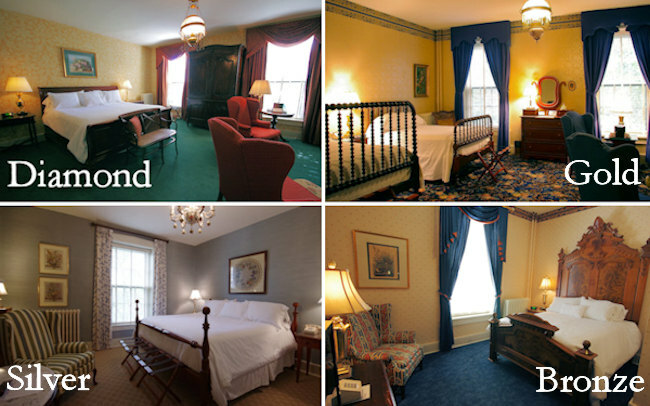 Each room in the Main Inn, built in 1845, is individually decorated with antique furnishings and has a private bath, high ceilings, cable television, wireless Internet access, and central air conditioning. Guestrooms are located on the second and third floors. The parlors, dining room and gift shop are on the first floor. Morning coffee is available on the first floor beginning at 6:30 AM. Diamond Rooms are our most spacious rooms in the Main Inn and feature a king bed, sitting area and Dimplex electric fireplace. Gold Rooms are large corner rooms with two double beds or a king bed. Silver Rooms are just a bit smaller and feature a king or queen bed. See rates below. Call for reservations, 8 a.m. to 10 p.m. EST: 1-800-352-3992 or 859-734-3381. Check availability now & book online. Rates are double occupancy. Single occupancy rates available. Extra person charge: $20 for Children 11 and under and $35 for each adult. A $95 deposit is required for each room reserved. This deposit is refundable less a $10 per room cancellation/processing fee if the reservation is cancelled 30 days prior to the day of scheduled arrival. Any cancellation after the 30 day deadline but prior to 7 days of scheduled arrival will warrant a deposit refund less $35 per room late cancellation/ processing fee. All deposits are non-refundable after the 7 day deadline. For two-night minimum weekends and special package weekends, the deposit is the first night’s rate. Beaumont Inn is in the Eastern Standard (Daylight) Time Zone. Dining is offered in our Main Dining Room, Old Owl Tavern and Owl’s Nest Pub. Main Dining Room reservations are recommended for dinner. NOTE: There are NO dining options at Beaumont on Sunday evenings! We’ll be glad to recommend other nearby options.